last night we went to a halloween carnival at the community centre. it was your standard fair of games and face painting, crafts and running around. there was even a haunted house. cohen's eyes lit up as soon as we got there, all of a sudden it made sense why we dressed him up in that ridiculous elephant costume. he ran over to the bowling game and waited his turn, he rolled the ball, laughed and then fell quiet. he didn't want to run anymore, he mostly wanted to hang out behind my legs peeking out every now and again. when i tried to coax him out he went for desperate measures and climbed into the back seat of the phil and ted's. i knew something was up, he hates the stroller, he would never go of his own free will, so i watched his eyes. turns out that he spotted a volunteer dressed as a ghost manning a game in the corner. he couldn't take his wide terror filled eyes off of him. i thought i would be the good parent and take him over to show him that it is just pretend. i only made it five feet from the ghost and cohen broke out in screaming, clinging, shrieking, freaking. hmmmmm. really? my scared of nothing, dare-devil of a son is scared of a man in a sheet? how does he know this is scary? he didn't have fake blood on the sheet or a noose around his neck, nothing, just a sheet. then he noticed the kid in a spiderman costume, the adorned nylon over his face. oh dear. then there was another spiderman with the same thing (there were four spidermen there, the most popular outfit i think). by this time he had resorted to total silence and standing by the wall. we thought it was time to go, but as soon as we got out of the gymnasium he grabbed marko's hand and pulled him back in. this was a mystery he wanted to figure out. so he sat there and stared. eventually another volunteer in a scream mask was wandering around. i was worried that it would be the straw that broke the camel's back, but it wasn't, again he just sat trying to understand it all. marko thought we should take him into the haunted house, a throw him into the deep end to teach him to swim kind of strategy i suppose, but if anybody was going to be ok, it was going to be cohen. i said, ok, but only if he promised to get him out of there if the terror became vocal. turns out he was starting to dig this being scared stuff. there were apparently several people in masks in the room, many of whom popped out at you. sure he was startled, but he also laughed and when they exited, he insisted on going back in. now that's the cohen i know. we have a couple of masks here at home, and this morning marko thought it would be fun to put one on. 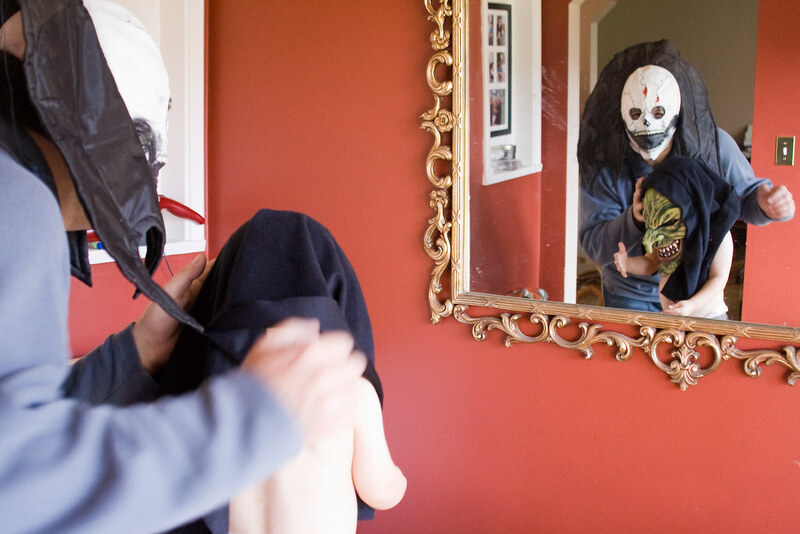 cohen started walking backwards slowly until he was practically clinging to the wall when he first saw him wearing it, but when he realized it was just daddy and that he too could wear the mask (and look at his strange self in the mirror), well it became pretty cool. 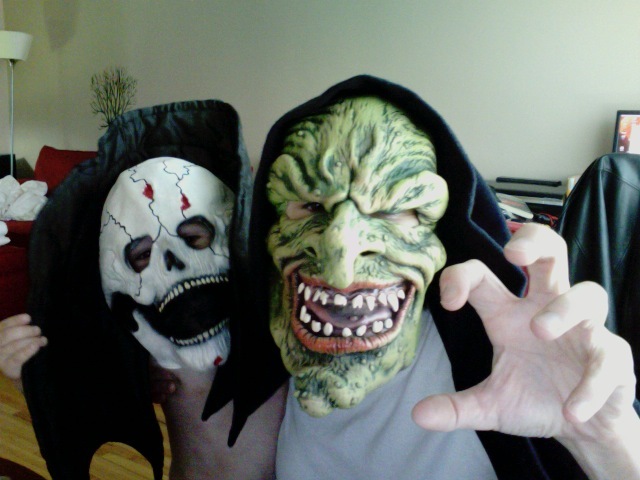 so all morning he has been wandering around alternating between masks. he has also tried putting one on galena and ada, and gets pretty insistent that marko or are should be wearing one with him and growling. i think there just may be an actor in him yet. So adorable, Daddy & Cohen wearing their masks, practicing. Love the description of his reaction to the carnival - poor guy. I sort of forgot that Halloween must be scary at one point!